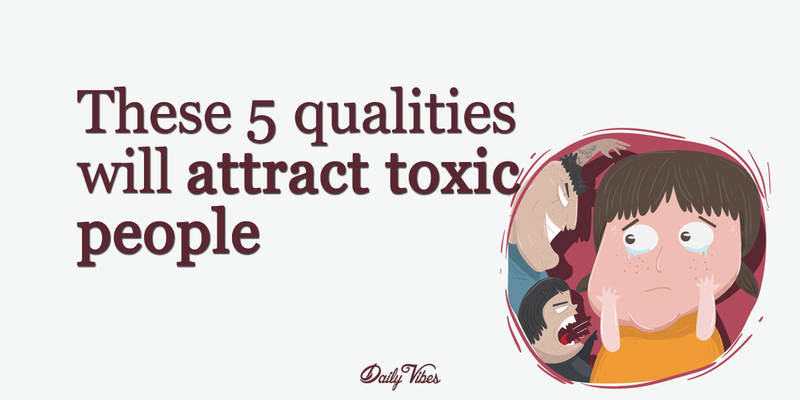 These 5 Qualities Will Attract Toxic People To You. Home » mind » positive life » These 5 Qualities Will Attract Toxic People To You. Attracting toxic people in your life isn’t something we can always avoid. Everyone knows the feeling of being around a toxic individual, but it’s our human nature to ignore it for the sake of a friendship or even romantic entanglement. When you do finally accept that the person around you is toxic, the reasons become obvious. Although we can’t always recognize a toxic person when we see one, we can recognize the invitations we provide those people through our behavior. Check out these five shocking reasons you attract toxic people in your life. You’d never think these qualities would backfire when it comes to your personal relationships. 1. You’re a Good Listener. Finding a good listener is hard to come by these days. Technology has made it easy to get distracted, and our attentions aren’t always on the people around us. If you’re a good listener, you’re going to attract all kinds of people, especially the most toxic. Toxic people love to talk about themselves, and they will for hours if you let them. They don’t need to hear your advice or take on a situation, they just want to hear it their way. 2. You Give Your Time Generously. In most scenarios, this a good thing, but know that it will attract toxic people into your life. Toxic people want to be at the center of other peoples’ lives, so if they know you’re going to drop everything for them, they’ll take advantage of you. Over time, this kind of behavior will inevitably result in your resenting them for it, and it’s going to start trouble. Establish boundaries in your relationships to avoid it. 3. You’re Both Open and Honest. Not many people are willing to take chances or major risks in life when it comes their goals. If you aren’t one of these people, and you’re honest about what you want to achieve in life, you will attract some toxic individuals. Toxic people don’t want to see others around them succeed, which means they’ll be ready with a words of discouragement. Making progress toward your goals will only force them increase their discouraging efforts. 4. You’re Relaxed and Easygoing. This is a quality that will attract a lot of people to you, including toxic people. This is the exact opposite of a toxic person, and it’s what they will naturally seek out. If you’re easygoing, they will automatically think you’re someone who they can control or manipulate for their own selfish gains. 5. Your View of Humanity is Positive. You may be surrounded by people who are generally decent and positive, but this doesn’t describe every human you’ll come into contact with. If you’re view of humanity is positive, these means that you won’t negatively judge a toxic person when they come into your life; it may even take a long time before you consider the possibility.